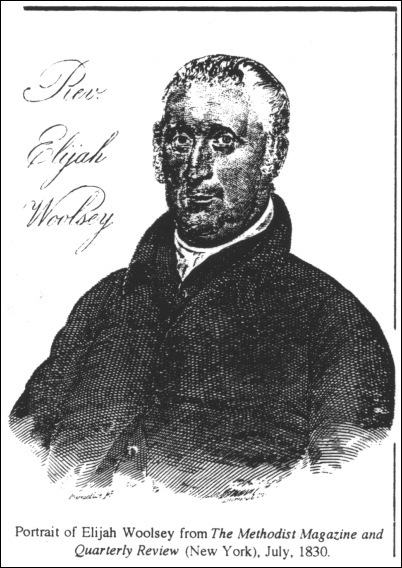 In 1830, Elijah Woolsey, a retired preacher of the Methodist Episcopal Church in the United States, wrote his memoirs of some 43 years of ministry. These were published in seventeen instalments in the CHRISTIAN ADVOCATE, a weekly four-page newspaper published in New York by the M.E. Church. Five of these chapters describe his two years as a saddlebag preacher in the Bay of Quinte & St. Lawrence regions, in 1794 and 1795. His memoir is the earliest first-hand account of a Methodist preacher in Upper Canada. Born in Marlborough, Ulster County, New York, on July 26, 1771, he was raised by pious Presbyterian parents. In New Jersey, the family were won by the preaching of Methodist itinerants, especially by the influence of Rev. Ezekiel Cooper. In this case, the mantle of Ezekiel fell on Elijah, and the latter responded to the call to preach, along with his younger brother Thomas. In 1793, he served on his first circuit at Cambridge, N.Y. A year later, he responded to the appeal of Darius Dunham (Presiding Elder for Upper Canada) for volunteers to serve the opening field in Upper Canada. Such foreign service required full credentials, and so Woolsey was ordained both Deacon and Elder by the Conference. The nineteen day journey to Canada is described in detail as Woolsey, Dunham and James Coleman followed the rivers and lakes northward. Although he was appointed to the “Upper Circuit” on the Bay of Quinte, and Coleman to the “Lower Circuit” on the St. Lawrence, in actuality they switched, as the memoirs indicate. The following year the two men exchanged circuits, Woolsey serving the Bay of Quinte, accompanied by a new recruit, Sylvanus Keeler. The memoirs were also published in book form, compiled by George Coles, as The Supernumerary; or, Lights and Shadows of Itinerancy (New York: Lane & Tippett, 1845). Here are some excerpts of this remarkable, newly discovered part of the Hay Bay story, with headings added. I attended the conference [at New York, August 25] in 1793, and arrived at the place in the evening, and was appointed to preach the next day; but the cross of having to preach before the preachers was so great, that I slept none that night, but prayed and wept all night. As I went to the meeting house, my knees smote one against another, and when I was in the pulpit, I trembled so much, that I could not hold the hymn book steady enough to see to read the hymn, without laying it on the pulpit and placing my hand on it. I then thought I should not live long, if such were to be my trials. After prayer, however, I gave out my text, and my fears were soon gone, and by the help of the Lord I preached for once, if I ever preached in my life. I had brought no written recommendation with me to the conference, but my presiding elder spoke to Bishop Asbury, who wished me to relate my experience and call to the work of the ministry. The bishop and conference seemed satisfied. I was received on trial into the travelling connexion, and was appointed six months to one circuit [Cambridge] and six months to another for the succeeding year. During the latter part of the year I had some exercises of mind respecting offering myself as a missionary for Canada, for at that time it was customary to send to Canada only such as volunteered to go. At the conference in 1794 [at Albany, July 10] brother D. [Darius Dunham] came from Canada, and asked me if I would go with him to the province. I consented, and though I had not had a regular appointment more than one year, the conference accepted of my two years’ service, such as it was, and I was ordained a deacon in the church of God, and as it was now going out of the States, I was ordained elder the next day. Brother J.C. [James Coleman] was appointed to go with us. So after conference we set out for Canada. But the parting with my relatives and near friends was a great trial to me, and I was glad when I was out of sight of the house. We went by the way of Albany and Schenectady. At Albany we laid in our provisions for the journey. When we came to Schenectady, we found that the company with whom we had intended to go, had taken their departure. So we tarried a week, and provided ourselves with a boat. Two men had engaged to go with us and to work their passage up the Mohawk, but an enemy to the Methodists persuaded them to relinquish their engagement with us, which they did, and went with him. We were then left alone, and had to work our own passage. When we came to the first rapids, which by the Dutch people are called “knock ’em stiff,”* we had our difficulties. I had never used the setting pole in my life, and my colleague J.C. was not a very good waterman. When we had almost ascended the rapids, the boat turned round, and down the stream she went, much more rapidly than she went up. We tried again, and when we had almost conquered the difficulty, the boat turned again. I then jumped overboard, thinking to save the boat from going down stream. But the water was over my head. So away went the boat with my companions in it, and I swam to shore. The next time we “doubled the cape,” and that day made a voyage of ten miles. At night we brought up the boat and made her fast to a tree. We then kindled a fire, put on the tea kettle and the cooking pot, boiled our potatoes, made our tea, and ate supper with a good appetite and a clear conscience, and after smoking our pipes and chatting awhile, we sang and prayed, and then laid ourselves down among the sand and pebbles on the bank of the river to rest; but I was so wearied with the toils of the day that I could not sleep much that night. * The “Knock-em-stiff’ Surprise Where were these “Knock-em-stiff” rapids? An enquiry to a county historian near Albany brought a surprising response. Dr. Philip Lord, Jr., of the New York State Museum saw my letter and wrote that it “was one of the most exciting questions to cross my desk in some time… [it] strikes right at the heart of my research project.” For many years he had been collecting accounts of early travellers on the INlohawk River, in order to document the progression of locks and canals built before 1820, when the Erie Canal was begun. Woolsey’s articulate account predated almost anything he had found. He was excited and so was I. A small, trivial piece of my puzzle became an important piece of his. The rapids were located about two miles west of Schenectady. 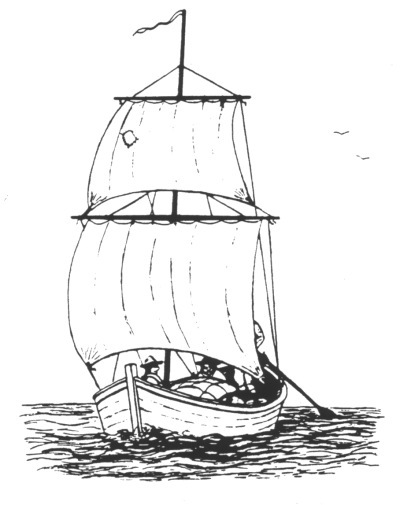 He identified their boat as a typical flat-bottomed three-handed batteau, perhaps 30 feet long, which was poled upstream with 12-foot-long iron-tipped poles, and run in deep water or downstream with oars or sails. The silhouette below portrays just such a boat. J.W.L. Our toil by day made repose welcome at night, so that when the morning light appeared we were rather loath to leave our humble beds. The weather, however, warned us to depart. It became stormy by day, and much more so by night. We had rain and snow fifteen days out of nineteen during the journey. When we were going down the Oswego river, two men hailed us from the shore and desired to work their passage about twenty miles. It was very stormy. I was very weary, and glad to rest a little. So we took them in, and I took the helm; but being warm with work, and then sitting still in the boat, I took a violent cold. Toward evening we saw a small log house, and went to it. We found the woman sick in bed, and the man in poor health. They had three children, but very little to eat. Here we lodged all night. I laid down on the stones of the floor which were very hard and uneven, but we kept a good fire all night, and I got into a perspiration which relieved me of my cold a little, so that in the morning I felt much better than on the preceding night. Brother D., being a physician, administered some medicine to the woman which greatly relieved her also. She appeared to be a pious woman, and had been a member of the Baptist Church at Ridgefield, in Connecticut; but said she had never seen a Methodist before. We had a very pleasant and edifying interview with the family that evening in religious conversation, singing, and prayer. When we found out that they were so destitute of provisions we divided with them of all that we had. They appeared equally surprised and thankful; surprised that Methodists (of whom they had heard strange things in their own country) could be both religious and kind, and thankful for the timely relief. They wished that we would tell any of our Methodist friends who might have to travel that way, to be sure and call on them. They desired us also if ever we came within forty miles of them, to be sure and go that much at least out of our way to see them—telling us that we should be welcome to any thing that the house or farm afforded. The house, however, was not likely to afford much, and there was scarcely any thing on the farm but forest trees. This was the only time during our journey of nineteen days that we found a house to shelter us, and it was good for that family that they entertained the strangers, for we were in truth as angels of mercy to them. They must have suffered greatly had we not called on them at that time. At night I have often hunted for a stone or a stick for a pillow, and in the morning when I took hold of the oar or setting pole, I had to do it as gently as I could by reason of the soreness of my hands, which were much blistered, &c., in rowing the boat. We attended to family worship night and morning, although we slept in the woods, and the presence of the Lord was with us of a truth. When we arrived at the fort of Oswego on lake Ontario, we were searched to see if we were not “running goods” as they called it. This being adjusted without any difficulty, for we were neither spies nor smugglers, we were now ready to embark on the lake, but the wind blowing high, we were detained two days longer. At length there was a calm, and we ventured out on the broad lake;—and when we had gone about twenty miles, the wind rose again and blew tight ahead, so that we had to shift our course and steer for the Black river country. The seas ran mountain high, and before we reached the shore we struck a rock and split our boat–a circumstance which made sailing still more dangerous and unpleasant. We had a quantity of books on board, which were considerable injured by being wet. When we came ashore we made a fire, and dried our clothes and the books, and mended our boat as well as we could. The next day we embarked again on the lake, but the wind met us which caused us to turn our course. We made for Salmon river, where we put in for that day; and early in the morning the next day, we started again, and pulled at the oars until day light disappeared in the west. We went round Stony Point and into Hungary bay, and landed on Grenadier island. When we struck the shore I sprang out of the boat and fell down on the beach, and thought I never knew rest to be so sweet before. But we were sensible that it would not do to sit still. Therefore we kindled a fire, boiled the tea kettle, and cooked some vistuals—ate our supper, attended family worship, and retired to rest. Our weariness invited repose, nor did the murmur of the wave disturb our slumbers; and besides, we had that very necessary requisite to sound sleep recommended by Dr. [Benjamin] Franklin, namely, a good conscience. On this island we found a fortification, and trees growing in the entrenchment, which seemed to be at least one hundred years old. The island is in the mouth of Hungary bay, and is subject to high winds. Here we were detained until we were brought to an allowance of bread, having only one biscuit a day. I would have given considerable for a piece of bread as big as my hand if I could have obtained it, but we were afraid of making too free with our little stock, lest it should not last us until we could get from the island. We ate our last biscuit about the middle of the day we left the island, and got into harbour on the main land about 11 o’clock at night, and glad enough we were when we landed. We put up that night at the house of our kind friend Parrott, Esq. * He and his wife were members of our Church and received us very kindly. We informed him how it had been with us respecting food. Sister Parrott hastened to make supper ready, but it was as much as I could do to keep my hands from the bread until all was ready. We took care not to eat too much that night, fearing it might not he so well for us. We retired to rest on feather beds, but it was a restless night to us all. Brother C. had a mind to leave the bed and take to the floor, but I told him we must get used to it, so he submitted; but our slumbers were not half so sweet as on the sandy beach and pebbled shore, when we were rocked by the wind, and lulled by the rippling wave. * James Parrott was a Loyalist from White Creek, Albany county, N.Y. He settled on lot 26, first concession of Ernest-town, where Parrott’s Bay still bears his name. In 1792, the Ernestown Chapel was erected on his farm. He died May 5, 1821, in his 79th year. When we came to New-York the yellow fever was there, in consequence of which the conference was removed to White Plains in West Chester co., N.Y. The session was a very pleasant one. The preachers, after an absence of twelve months, were glad to see each other. We loved one another, and whilst we were together the Spirit of glory and of God rested upon us. We felt willing to live, to suffer, and to die together. If one had received a little more than his brother, he was willing to divide with him. To be sure, we felt sensible of our deficiencies, as well in regard to remuneration as qualifications for the work. But we hoped to share the spoil together in a better world, when all our toils were over, and all our griefs were spent; and this hope was as an anchor to the soul amidst all the tempests and billows with which we had to contend. When the appointments were read out, the preachers appeared to receive them gladly. My appointment was to the Bay of Quinte circuit. On our way to Canada, we were met at Schenectady by some of our Canadian friends, who helped us on our way. We ascended the Mohawk in company with Captain Parrott, who, though not a professor of religion, was very friendly, and we got along without any difficulty until we came to the Oneida lake. When we arrived at the lake, the wind was very high, and the lake was all in a foam, which continued all that day, and until about midnight. The wind then ceased, and the troubled waters became calm. About 1 o’clock, A.M., we embarked on the lake, and after we had rowed about six miles down the lake, the wind began to roar tremendously, and streaks of light broke through the clouds in a manner I had not seen before. Our captain seemed to understand it as foreboding a heavy storm. We therefore made what preparation we could to encounter it. We spread our little sail, expecting the wind aft. We lashed two oars to the stern. The wind soon struck us, but we received no particular damage. The clouds were dense and dismal, and the waves broke over us with fury. Our friend, the captain, though an old sailor, was frightened, and cried out, “We are all dead men!” I said, “The Lord will provide;” and yet, notwithstanding my firm confidence in the power and mercy of the Lord, I sometimes feared for a moment that the lake would be my grave. These fears, however, were salutary. They caused me to examine myself and the motives which induced me to undertake the work in which I was engaged. At length the good providence of God brought us safe through. When we reached the shore, we all rejoiced. The captain said he did not much expect, at one time, ever to set foot on dry land again, and that all his hopes were founded on this consideration, namely, he did not know but that the Lord might spare his life for the preachers’ sakes. In due time we arrived in Canada, and our friends received us gladly. We enjoyed many seasons of refreshing from the presence of the Lord on the circuit this year [1795-96]. Some part of the circuit I had to travel on foot, being unable to get my horse across the bays and rivers. Sometimes I had to travel 15 miles a day, preach twice, and have never sat down from the rising to the setting of the sun. My knees and ankles pained me very much, and when I was preaching I used to stand sometimes on one foot and then on the other, to get rest. But rest was not easily obtained; even in bed my knees and ankles were so swelled and full of pain. My soul, however, was happy in the Lord, and my spirit rejoiced in God my Saviour. The flesh was often weak, but the spirit was willing to endure hardness as a good soldier for Christ’s sake. On this circuit I used to meet the natives, the red men of the forest. One time, as brother D. and I were riding near the woods, we saw a little ahead of us a company of Indians, fifteen in number. They had been drinking too much, and were painted as if they were going to war, a red streak of an inch wide and a black streak of the same width all over their faces and hair, most frightful to behold. When we came up with them, we saluted them with “Sago, brother,” at which they returned the same salutation. But they got before our horses, and made motions for us to dismount, which we were not inclined to do, and shook our heads to intimate the same. They then let us pass, after giving such a yell as made creation ring again. But we were right glad when we had got rid of such troublesome company. Some of the natives are good singers. There was one named Red Jacket with whom I used to sing. He had the Psalms translated into Indian, and would sing in Indian whilst I sung in English. The New Testament and Psalms were said to be translated by Capt. [Joseph] Brant…. Having finished my tour on this circuit, and my mission in Canada, I repaired again to the conference, which was held in New York, and received my next appointment to Redding circuit, in the state of Connecticut….